Doing your homework can be such a discouraging task to do as a student especially if you have a ton of them waiting to be done. What can make it more discouraging is if you do not know which ones you should be attending to first and which ones have the earliest deadlines. It can be very confusing and can even cause stress. Now, as a student, you do not want to be stressed, right? You want to keep it cool and make it seem like you got it all together. So, guess what? We have a simple solution for you! You may also see sample work schedules. We would like to give you a simple outline on how you can come up with your very own homework planner samples and templates to ensure that you are able to catch up on all your homework deadlines and ensure that you know all that you would be needing for your specific homework. Get your pen and paper, or whip out your computer’s notepad and start taking notes on how you can come up with your very own homework schedule. Did we mention we have included a couple of homework calendar templates to make your search for good homework schedule templates way easier? We have uploaded it right here in this article. 1. Make your homework a priority. You will have to assess if you are allotting enough time for your homework or otherwise. A ton of times, it will be a matter of what you are actually giving priorities to first. Whether or not you are in the mood to do your homework or do a little bit of studying, you want to make sure that your schoolwork is your priority as a student. You do not want to be complaining about not having time to do your schoolwork if you know that you chose to go to the movies on your free time, right? A solution to this would be to make movie time or mall time a reward after you have done your homework. Just make sure to make your school work a part of your daily routine and you will definitely get the hang of doing your homework on a daily basis, even on Fridays. More time for the weekend, right? 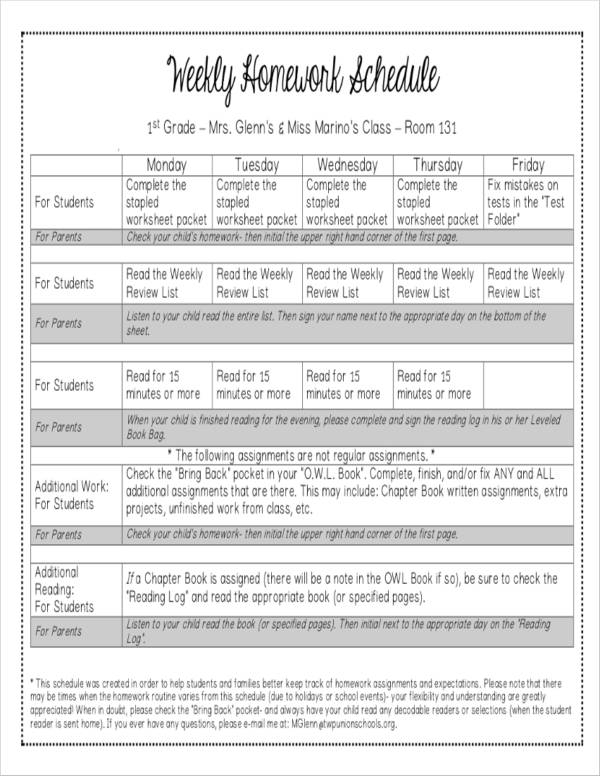 Take a look at Printable Daily Schedule Templates for more tips about how you can make a daily schedule that will make your homework tasks way easier. 2. Make and follow. Come up with a to-do list template wherein you can prioritize homework that are either easy to do or are due the earliest. In your list, you will list down all that you would like to get done within the day and rank them according to their importance. Make sure that you include break times in between your homework as well to ensure that you brain is fresh once you start on a new homework. A five-minute break would be enough in between homework or a twenty-minute break after doing an hour’s worth of homework will help you to relax and refresh your brain. Take a look at our printable to-do lists to see how you can make your very own to-do list. 4. Projects and undone tasks. Not all homework can be done in one day. Others would need more than a day to finish. So you have to make sure that you also keep track of the tasks that you have yet to finish and ensure that you finish it all before the deadline arrives. You do not want to be procrastinating on any big homework as they are due a bigger credit than your other homework. Make sure that you are careful with how you prioritize big homework because you do not want to do big tasks at the last minute or else, your homework will end up being mediocre. You also lessen the risk of your homework from getting forgotten if you list them all down. A daily worksheet template can help you track what you have done and what needs to be worked on as well. 5. Divide big assignments. In line with listing down undone tasks, you can breakdown bigger assignments such as papers and big projects into smaller parts and have a schedule for each part. This ensures that you have enough time to finish big assignments on time. As you are breaking down bigger assignments, make sure that you still have enough time to do your other homework as well as your extracurricular activities. You may also like employee schedule samples. 6. Short periods of time = short parts. While on short breaks, you can still do some homework or a quick research to ensure that you are still able to prioritize your schoolwork. Of course, you can always choose to start your homework when longer blocks of time come around, but imagine how many short time periods you have wasted waiting for big blocks of time. You may also check out event schedule templates. 7. Learn to say “No” sometimes. There will be times when you will find that you are getting invited to watch a movie after school or that you go eat out for lunch. Your classmates, a ton of times, do not realize how important doing your homework is to you at the moment. With that being said, you want to make sure that you politely say “No” and that you clearly explain to them why you have to decline their invitation. Tell them that you need to get everything done first before you go hang out and that you will definitely go out with them once you have everything under control. You might be interested in meeting schedule samples. 8. Choose the best time of the day. Assess whether you want to do your homework during the day or during the night. Notice which times are good for you and which times are slow for you. This way, you will know when you would need to do your homework. Take note that you should do your bigger homework during the best time of the day. You may want to check out our daily agenda templates. 9. Start with simpler tasks. For bigger homework, you can start with the simpler parts and move on to more difficult parts once you are done with the simpler tasks. Though these might not be easy to do, you want to make sure that you still make it seem as if it is easy. Gather all the materials that you would be needing such as books to ensure that they are within reach once you get started on the homework. We have project task list templates that you can look into should you want to incorporate task lists in your homework schedule. 10. Work first. The main rule about being a student? “Work first before anything else.” Doing so can help lessen the likelihood that you will procrastinate. Of course, you will still do normal things such as watch TV, clean your room, etc. But just do it once you are done with all the school work that you have. Get work done early to ensure that you have more free time later. Always remember that you should do all of your homework ahead and lessen unnecessary distractions as much as possible. You may also see vacation schedule templates. Even if you follow certain schedules, there are still probably homework that will be harder than others. You think that it will get easy as you try to continue doing it but sometimes, it might just seem as if it is getting harder and harder as time passes by. You may also see sample class schedules. So, what do you do when things start getting harder? You ask for help. You should not be embarrassed about asking for help as not everyone will understand everything about the given homework. Who do you ask help from? Here’s a quick list. 1. Ask your teacher. Your teacher will be the best person to ask as he/she is the person who gave you your assignment. However, if you do not feel too comfortable with your teacher, maybe you can try to ask other teachers who have the same expertise as the teacher that has given you the assignment or maybe even your guidance counselor. 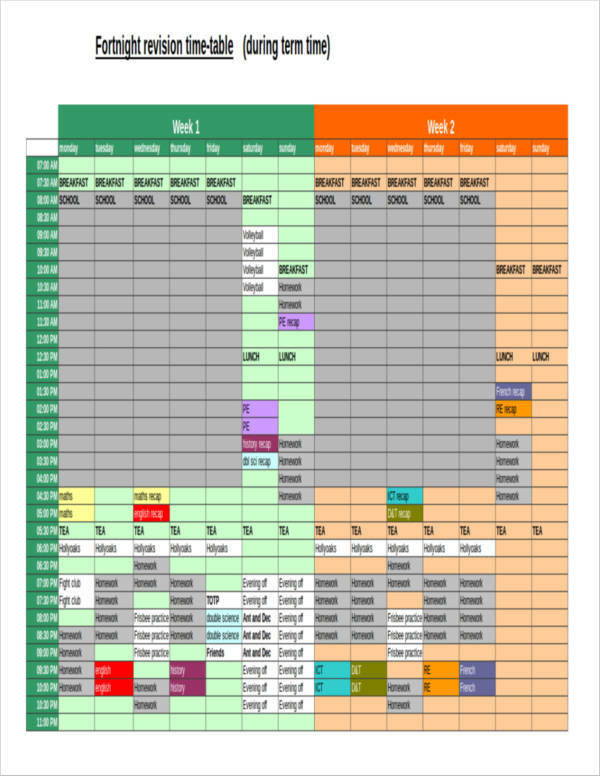 You may also like staff schedule templates. 2. Ask your classmate. If you are uncomfortable asking your teacher or counselor, maybe you can ask one or two of your classmates. You can ask one of the people in your class to study with you after school or during your free time and ask him/her some of the aspects of the homework that you seem to be having problems with. You can work on it together to try to get it right together. You may also check out sample project schedules. 3. Find someone to tutor you. If you are having trouble understanding a couple lessons in some of your subjects, you can try to ask your parents to give you a tutor. Getting a tutor can be very costly, so you have to make sure that you are set on getting a tutor. Your teacher or guidance counselor can also give you recommendations for tutors that might be able to help you out. You might be interested in appointment scheduling samples. Doing homework is something that every student might not really want to do but actually has to. Doing it is definitely not easy, that is why we have homework calendars to help you do your homework a whole lot easier on a daily basis. We hope that the tips that we have given as well as the step-by-step guide that we have shared have helped you out. 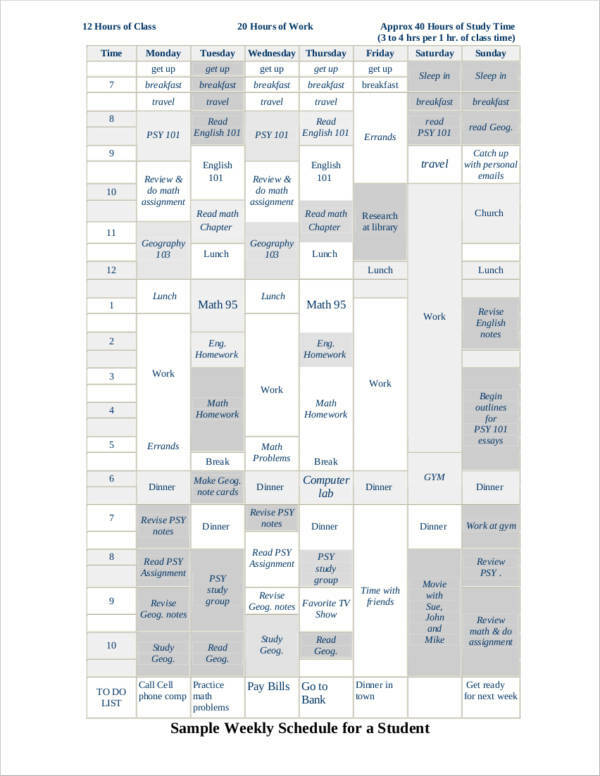 For more information about making homework schedules, you can take a look at assignment schedule samples and templates.